In the last year, I completed one game—Batman: Arkham Asylum. And by completed, I mean the story portion of it. That isn’t to say that is the only game I bought. From the likes of Uncharted 2, to older titles such as Dead Rising, video games were one of my largest investments in the past year. But I am never left with the time or patience to sit through a game’s entirety. An early case of it this year would be Darksiders. 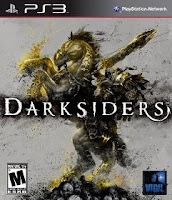 Inspired by older titles such as The Legend of Zelda, and God of War, Darksiders looked to create its own image through its art style and game-play. The story follows the Horseman War during the apocalypse, which has begun prematurely. Stripped of his powers due to this minor mistake, War embarked on a quest to find the one responsible and gain his revenge. At first, it did not fail to impress. With Joe Madureira’s artistic rendition of war that would make Sun Tzu proud, and a taste of some of the powers we would later unlock, the game’s prologue did its job of drawing the player into its world. After a series of battles with different enemies, and a cut-scene full of clichéd dialogues, War is stripped of his powers at which point he decides to solve the mystery behind the premature apocalypse. While the game still maintained the same level of fun as the prologue, it was intentionally slowed down to allow the player to explore the world and grasp the story itself. It was fun to look around and notice some cool designs for buildings and it was still satisfying to defeat enemies with a swing of Chaos Eater—the sword that looked like it was injected with steroids. The game got even more interesting when the player was pitted against bigger and meaner bosses. This is where the game began to lose some originality. After grabbing the “still beating heart of Tiamat” and “awakening” the chaos form of War, we set out to find the next of the 4 demons. At this point you are introduced to newer monsters, mixed in with the older ones. They come with different weaknesses which forced the player to change strategies. After a while however, the process of defeating these enemies became repetitive. You are asked to enter the same arenas and fight the same monsters in order to unlock the next gate. This included filling the arena with the very same bigger and meaner bosses, while putting a time limit on the level. This was a great concept to start, but it eventually took on a “rinse and repeat” pattern. It made for a great challenge, but eventually, after losing countless times and gnawing on one too many wires out of frustration, I stopped playing. That is absolutely not a sign of the games quality being sub-par. It was one of the more satisfying games I have tried in months if not years and was absolutely delighted to have a chance to play it. The Tiamat, being the only boss I fought in the game, was well designed. Her powers varied from long range fireballs to running you over, but were used in good balance. The graphics were solid, save a few hiccups in frame-rates and load times. The game-play mixed the best of the puzzle-platforming style from Zelda and the over-the-top action of God of War. The weapon and attack upgrades were cool but the game could have used more innovation in these. The voice acting was phenomenal, given the rather clichéd dialogue. After all, anything with Mark Hamill has to be of at least decent quality. In the end, it is a game that had enough to keep me interested for a few hours and about a week; longer than other games have kept my attention in recent months. Maybe down the road, when I decide to finally complete my embarrassingly long catalogue of games, this could be one of the first. I'm two hours in, and I'm bored. I really wanted to enjoy the title... I'm still playing it though.